With all the great sites out there selling various sports memorabilia, let us take a look at one of the best ones in terms of cost and variety. Steiner Sports Memorabilia is the premier one-stop-shop for all of your memorabilia needs. Whether you are looking for something football, hockey, basketball, or baseball related, Steiner Sports has everything you need. If you are not a fan of professional sports – Steiner has you covered there as well! Let’s take a look a brief overview of one of the best memorabilia sites out there for you to add those special additions for your man cave! When we all think of sports memorabilia, the first thing that tends to come to mind is autographs and jerseys. Rather than limiting yourself to those few football items, Steiner Sports has created a wide spectrum of various football related items, ranging from jackets worn by the Packers staff in the 60s, to current game worn gear. I have purchased almost a dozen different items from sports, most of which pertaining to the NFL and have had 0 issues. In the months I have been researching Steiner Sports, I have learned that they are the real deal- providing you with authentic memorabilia as opposed to the knockoffs. Finding a website that specializes in authentic memorabilia can be difficult, but Steiner takes that worry away with their certificates and refund policies. Imagine having a wall of signed items – great right? Now imagine have a few signed photos on the wall, mixed in with game worn gear and autographed game balls and mini-helmets! 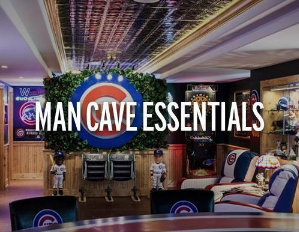 With that concept, your man cave went from a 4 to a 10 in a matter of a few clicks! The items available are endless, and I encourage you to click the link below to see what I am talking about! If football isn’t your cup of tea, we have a few options in the baseball field as well! What better sport to kick off true memorabilia than baseball, America’s past-time! Similar to football (and all sports for that matter, Steiner Sports has a variety of memorabilia options that will allow you to purchase autographed photographs or jerseys! One of the best options that Steiner has over any of the other sites is that you can also get vintage memorabilia from not only decades ago, but even a century ago! At the moment, they have a 1924 signed baseball from 12 of the Cubs, including the legend Grover Cleveland! Not only this, but there is also a 1925 World Series program from the game between the Washington Senators and Pittsburgh Pirates. Those two options are just a little taste of all that Steiner has to offer for baseball themed man caves. If you are looking to spend a little less, they also have game used gear, stadium signs, bases, and stadium seats! Rather than pay for the rip-offs you find everywhere, Steiner Sports memorabilia is authentic and can be acquired with all documentation showing the item’s validity! This sport has been around for over a century, and the amount of memorabilia is truly endless. If you are looking for a single item or multiple items for your man cave, this is the best option available and a reasonable price! Larry Bird, Michael Jordan, Lebron James, Wilt Chamberlain and many more – all legends of the game who have numerous memorabilia items out there of you to purchase! Whether you are a fan of old legends or the new age era, Steiner Sports has so many options for you out there that is authentic and unique! IT’S BACK! 40% OFF Authentic Sports and Entertainment Signed Memorabilia at SteinerSports.com! Use code GREEN40 to save on full-priced items thru midnight ET on Sunday 12/16. We have already touched on Steiner Sports’ wide variety of signed photos and jerseys in prior sections, but what hasn’t been mentioned is their immense amount of signed basketballs and basketball court floor pieces signed by numerous players. These floor pieces range from an authentic piece of 1973 MSG court with a glass display case and engraved gold plate to 98 Michael Jordan signed floor piece from the championship game. With so much memorabilia available, it would take months to mention them all! However, with all the hype over sneaker battles it feels like an obligatory shout out to all the signed sneakers that Steiner Sports has available for your man cave. Whether you are looking for throwback sneakers from decades past; or perhaps newer player’s custom shoes with their signature and number – all of these items are at your fingertips should you want to add that little extra for your man cave! If you aren’t a fan of the finesse of basketball and prefer the grit and grind of a fast paced game, Steiner has you covered with their immense amount of hockey items up for sale as well! This sport theme for your man cave (in my opinion) is the most intriguing of all. There are so many players in a variety of hockey leagues across the world that have signed photos, ranging from their shots to some epic fights. Unlike other sports memorabilia, hockey related items have the grit and finesse with item. Whether you are looking for signed jerseys or game worn jerseys, there are a variety of Steiner options out there that are from every league. Currently, there are NHL game and practice jerseys, AHL jerseys, World Cup jerseys, KHL jerseys, and so much more! If jerseys aren’t your thing, Steiner has authentic helmets, gloves, sticks, pucks, skates, and other equipment all up for grabs! You could basically create a whole display of your favorite player or team from the top down – all purchased in one location! There are far more items than I can list on one web page or review, so I encourage you to give the link a click and see for yourself! There are always items on sale – I will continuously update this page to include those so you get the best deal for your man cave sports memorabilia! Whether you are a fan of gritty sports like hockey and football, or perhaps prefer skill and finesse like basketball and baseball, Steiner Sports has a plethora of sports memorabilia out there to boost your man cave onto a new realm of perfection. If you have any questions or concerns related to the site or any items in particular, feel free to leave a comment below! Hi there, interesting piece here! That Michael Jordan memorabilia seems very cool! Do you know if Steiner has any golf memorabilia by any chance? I’d like to know that! They do! Steiner actually specializes in all sports and various entertainment areas as well. Give them a look and you might find that special golf item! Some of your suggestions would look very nice in my game room. I have a side for baseball, hockey and fishing (one bass that was caught in 1957) and the opposite side Nascar and muscle cars (mostly Pontiacs). I do have signed gloves from hockey, bat from baseball and cars from Nascar. I will look at your links if to see if there are things I need to add to my collection. Your man cave sounds amazing! Although I am not huge into Nascar, I do love older muscle cars. I have been looking to do a post on car items that have been converted into seating – like a 60s Mustang that had it’s back seats ripped out and converted into a sofa! If you are looking to add to your collection though, I highly recommend Steiner Sports.